Almost everyone will get arthritis at some point in their lives, and the most common type is osteoarthritis, also known as OA. Osteoarthritis usually comes with aging and is frequently seen in athletes, overweight people, and “blue-collar” workers, as well. It is the “wear-and-tear” form of arthritis, and not the autoimmune type. OA is quite different from Rheumatoid Arthritis and other forms – but one common characteristic is for certain , and that, unfortunately, is pain. However, you don’t have to let OA pain disable you – and with the proper lifestyle changes it can be easily treated and managed – sometimes even prevented. There are many ways that you can “fight OA pain” or further prolong its onset. Staying active and maintaining a healthy and balanced lifestyle of wellness certainly helps! Even though exercise may seem hard to do when dealing with osteoarthritis, it is actually a natural pain reliever! Think of your body with OA as the Tin Man from the Wizard of Oz, and picture exercise – no matter how mild or rigorous – as the oil. The more sedentary that you are, the more your joints will stiffen and ache. This is true for any form of arthritis! Exercise needn’t be extreme…walking, yoga, water aerobics, and tai chi are some lower-impact ways to keep moving. Simply “staying nimble” is all it takes, but the more you can challenge yourself WITHOUT overdoing it, the better! Physical activity strengthens the muscles that support the affected joints, as well as helping to maintain mobility and prolong disability. Moderate exercise also can prevent weight gain, which is also a big risk factor for this type of arthritis. 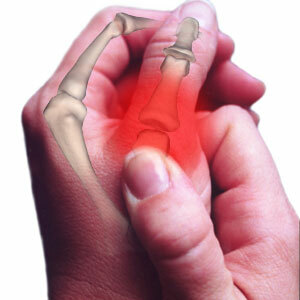 Osteoarthritis can be treated with medications and/or naturally. Most physicians or rheumatologists will prescribe a nonsteroidal anti-inflammatory drug (NSAID) and/or pain meds (narcotics) to control symptoms. However, if a person has OA they are still losing cartilage. To help combat this some doctors will recommend glucosamine, fish oil, and Vitamin D. Most doctors do, as mentioned, prefer that osteoarthritis patients also partake in stretching and physical activity. Doing the RICE method may help, too – Rest, Ice, Compress, Elevate. Sometimes a warm heating pad will help alleviate pains, too. Over-the-counter and prescription pain-relief gels, creams, and ointments can also do the trick. Your best bet is to educate yourself thoroughly on whichever type of arthritis you have, and consult with your doctor on which diet, exercise, and treatment plan works best for you! Remember that the Arthritis Foundation is here with the mission to prevent, control, and cure arthritis. If you need any information on how to keep moving or fight OA pain, please contact your local AF office. Tags: @ArthritisAshley, achy joints, advocacy, aging, Arthritis, Arthritis Ashley, Arthritis Foundation, Ashley Boynes, being active with arthritis, Disability, exercise, exercising with arthritis, Fight OA Pain, Health, Human Body, joint pain, keep moving, let's move together, Mid Atlantic AF, Mid Atlantic Region, MidAtlanticAF, OA, Osteoarthritis, physical activity, RA, Rheumatoid Arthritis, rheumatologist, sore, tai chi, types of arthritis, walking, wear and tear, Wellness, yoga. Bookmark the permalink. I would just like to point out that sometimes OA is due to a genetic connective disorder called Ehlers Danlos Syndrome. A genetic break down of the cartilage.